A postcard sent to Rev. R.B. Layton, Kentville, Nova Scotia ("Via New York") from C. Rogers mailed from Trinidad. 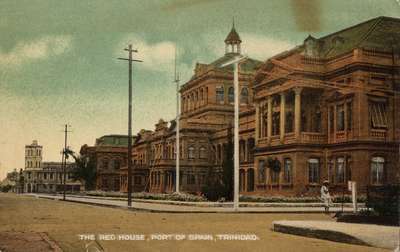 The Red House is the seat of Parliament in this capital city of the Republic of Trinidad and Tobago. The public named the original building "Red House" when it was painted red for the celebration of Queen Victoria’s Diamond Jubilee in 1897, but it was burned in March, 1903, during the Water Riots. The present building opened in 1907. We're both well and enjoying it here. Very dry. I don't know if I am actually any better or not. Feel O.K. Have not been to San Fernando yet. We were not at Tunapuna. Father has been out around more than I have. He speaks at Cowa on Temperance this week. Father sends his best.